It’s six chapters from Ulysses; it’s twenty locations from Dubliners; it’s fifteen of Joycean hostelries. It’s got over 100 spots from Ulysses. Each comes with excerpts from the works glossed with expert criticism, quirky facts, and contemporary images. We’ve tried very hard to be open to the beginner, but not boring to the expert. We set out to to bring Joyce to everyone, yet never be condescending. We set out to be informative, even erudite, but with a common touch. We really hope we’ve succeeded. Lots of people have helped us along the way—not least the James Joyce Centre. Walking across Calypo, Aeolus, Nausicaa, Lotus Eaters, Lestrygonians, and Sirens, you’ll hear the voice of Frank Delaney (American Public Radio called him “the most eloquent man in the world”). You can pause to enjoy a folder of contemporary images from the National Archive. Choose any of fifteen locations from Dubliners. Drop into one of the fifteen Joycean hostelries or hotels mentioned in Joyce’s works.Be excited by David Norris performing ten full minutes of Nausicaa. Or just enjoy the top-quality graphics, designed here in Dublin; we think you’ll love its beautiful interface. From 7 Eccles Street to the National Library, from Dublin Castle to Sandymount Strand, we’ve mapped for you the texture of the city through the footsteps of Leopold Bloom. It’s a place for saunterers, idlers, and tech-savvy literati. It’s a city guide, a study companion, an escapist's toy. It’s an indispensable tool for professors, pupils, experts and newbies. Like to see our story? You can even order the app in advance. Or check out the fabulous awards we students have designed ourselves. Just click on our Kickstarter page. 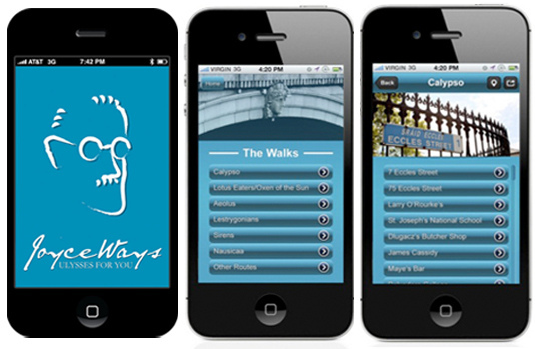 JoyceWays will be launched at the James Joyce Centre on 14 June, two days before Bloomsday.